Can anyone elaborate on this for me? I've just heard that Mayu has "disappeared." What does that mean? "Disappeared" as in Dada-not-showing-up-for-a-show, "disappeared" as in I-have-the-biggest-zit-ever-and-I-can't-face-the-world, or "disappeared" as in kidnapped-by-the-yakuza-for-his-r0ckz0rs-guitar-skills? The title to my autobiography is going to be: I drank so much tequila. isn't he sort of natorious for dissappearing at weeks at a time though? I'm not an egoist... I'm a realist who happens to be awesome! That does sound kinda familiar... I figure there's nothing to worry about though because I can't recall hearing about it on the LAREINE official website or anything... If he is gone, he's probably off on vacation or maybe he just doesn't want to be in the public eye for a little while? There's probably a rational explanation to it. Anyway, it would be terrible of a Visual Kei guitarist that isn't totally incompetent just vanished. Apparently he's cut off contact with the rest of Lareine for some time. He didn't come to rehearsals, so they had to get a support guitarist for Kamijo's birthday live (7/19), and they had to cancel Mayu's birthday live (8/5?) cause you can't have a birthday live without the birthday boy!! I believe he's done this kind of thing before though, while in New Sodmy. So he will be back, just not definitely when. Perhaps inertia will fill us in? And yeah, Mayu disappeared for a while when he was in New Sodmy. Was it ever revealed why he disappeared then? I think they might have called it "personal reasons" at one of the instore events, but to tell the truth my memory's a little fuzzy on that. I don't think they ever talked about it in any published interviews -- I just double-checked my clippings and it's amazing, in one article Mayu's there, then suddenly he's gone, and the band never volunteers any information and the interviewer never asks. thank you so much for information inertia! Yeah, thank you, Inertia! I wonder what's going on with Mayu. Does he have a blog or something that he updates? So I just stumbled into this dead end myself and am bumping this rather than making a new thread, has there been any new information on Mayu's whereabouts? Or was he successfully smuggled out of show business along with Klaha? As far as I know he just wandered off and never came back. What's in this thread is the last I ever heard. He's working with Azusa Kobayashi. She just put out an album where he played guitar and wrote music for it, along with performed in a concert last year. The first concert album to be released is a complete song by MAYU, a guitarist of LAREINE (Laraine). In addition, LAREINE's bassist EMIRU will participate as a comprehensive producer. Unlike songs of Azusa Kobayashi so far, the number that injures the visual lineage of the 90s is the core. Her new challenge and world are drawn, and it is expected work for its versatile expression power. Visual Kei Trashpile and flowersofnight like this. The whole deal kind of reminds me of Kanon Wakeshima, except tilted one or two notches closer to the "Moi dix Mois" end of the spectrum. It's OK, but kind of feels like it's lacking heart. I've seen Kanon in concert and she is really talented and cute. I don't get that from Azusa Kobayashi but then I am not familiar with her. Mayu looked like he could be back in Lareine in the video. 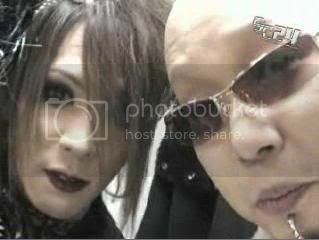 Wonder if he might show up in some other VK band or performance in the near future.